A heavyweight legal opinion from award-winning advocate, Aidan O’Neill QC, concludes that ministers could – and should – introduce legislation to ban fracking for underground gas. Campaigners are warning that if the government sticks to its plan to use policy levers instead of changing the law to stop fracking, this would amount to “a betrayal” of the tens of thousands who want the industry stopped. Opposition parties are now planning moves in the next few weeks to win agreement from the Scottish Parliament for a legal ban. In the past MSPs have repeatedly voted to ban fracking. The Scottish Government is due to announce its “finalised policy” on fracking before the end of March. Until now it has used a moratorium and what it called an “effective ban” in October 2017 to block fracking applications. But then ministers were sued for multi-million pound damages by the Grangemouth petrochemical giant, Ineos, for preventing its fracking plans. The company wants to drill wells across central Scotland to fracture underground rocks to release shale gas. In rejecting Ineos’s plea, the Court of Session ruled in June 2018 that there was “no legally enforceable prohibition” on fracking in Scotland. Instead the Scottish Government had “an emerging and unfinalised planning policy” that didn’t support the technology. Now O’Neill’s legal opinion – for the environmental group, Friends of the Earth Scotland – has concluded that climate and humans rights laws may require a statutory ban. Such a ban would also reduce the risk of further legal challenges from Ineos, he argued. “My advice in summary is that it is within the legislative competence of the Scottish Parliament to pass primary legislate in effect to prohibit onshore unconventional oil and gas exploitation in Scotland,” O’Neill said. For this reason “any failure to impose a ban on unconventional oil and gas development may constitute a breach of individuals’ fundamental rights,” he argued. He pointed out that France and Ireland had passed laws banning fracking, while Wales had issued a planning direction against fracking. There had also been bans and restrictions in the Czech Republic, the Netherlands, Bulgaria and Germany. Mary Church, head of campaigns at Friends of the Earth Scotland, argued that legislation would defeat any further legal actions from Ineos. “It is time for ministers to live up to their rhetoric and legislate to ban fracking for good,” she said. Church warned that the current policy on fracking could be easily overturned by a future government. “Continuing only to use policy levers would be a betrayal of the tens of thousands of people across the country who called on the Scottish Government to act to stop this industry,” she told The Ferret. According to opposition parties, O’Neill’s legal opinion was a game-changer. “It’s high time ministers delivered the legally watertight ban promised,” said the Scottish Greens environment spokesperson, Mark Ruskell MSP. Scottish Labour described the legal opinion as a “significant development” that brought “much-needed clarity” to arguments over fracking. “I will be seriously considering the next steps required to protect our communities, our environment, and our health from fracking in Scotland while also tackling climate change,” said Scottish Labour’s environment spokesperson, Claudia Beamish MSP. Penny Cole from the campaign group, Frackwatch, accused the Scottish Government of “prolonging the agony” for people living in the central belt threatened by fracking. She pointed out that ministers had already renewed the fracking licence originally granted to Ineos by Westminster. Callum McLeod, who co-chairs Our Forth Against Unconventional Gas, pointed out that 60,000 people had opposed fracking in the Scottish Government’s public consultation in 2017. They would question the “potential hollowness” of government promises, he said. The Scottish Government reiterated that it did not support onshore unconventional oil and gas development in Scotland. “Scottish ministers are entering the final stages of the policy making process on this important issue,” said a spokesperson. The spokesperson added: “The Scottish Government does not consider new legislation is necessary to control unconventional oil and gas development in Scotland and the adoption of a strong policy would provide appropriate and proportionate means to regulate such development. Ineos did not respond to requests to comment. The fracking industry association, UK Onshore Oil and Gas, declined to comment “until a decision is made”. 2011: Companies propose sites in central and southwest Scotland to drill for underground gas. April 2014: Public inquiry into plans to extract coalbed methane around Falkirk. August 2014: Petrochemical giant, Ineos, purchases fracking rights in central Scotland. January 2015: Energy minister, Fergus Ewing, announces a moratorium on fracking and coalbed methane. October 2015: Thousands protest against plans for underground coal gasification. December 2015: The Ferret publishes a series of stories on fracking. March 2016: Nicola Sturgeon says she is “highly sceptical” about fracking. 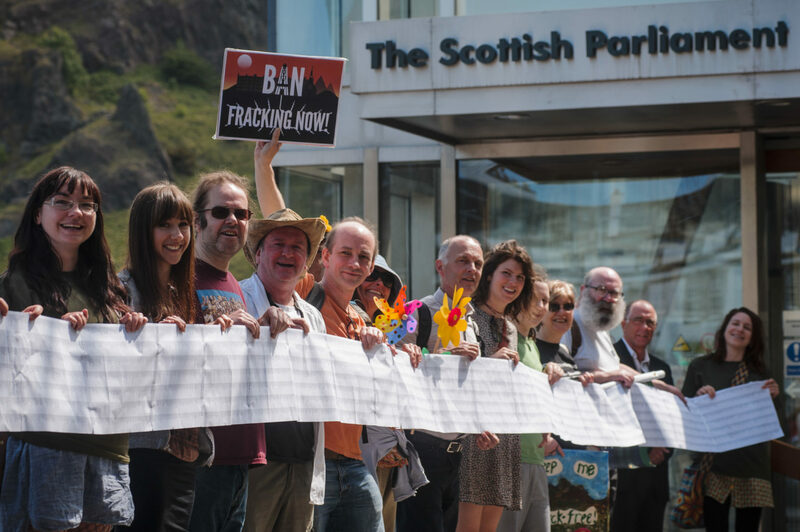 June 2016: Scottish Parliament votes for an “outright ban” on fracking. October 2016: Scottish Government rules out underground coal gasification. November 2016: Scottish Labour propose bill to ban fracking. May 2017: The Ferret publishes story about fracking in Pennsylvania. May 2017: Over 60,000 respond to consultation on fracking, 99 per cent of them opposed. October 2017: Scottish Government announces “effective ban” on fracking, backed by the Scottish Parliament. January 2018: Ineos launches legal action to sue the Scottish Government for multi-million pound damages for banning fracking. February 2018: Scottish Government gains devolved powers over onshore oil and gas licensing for fracking. June 2018: Court of Session rejects Ineos’s bid for damages on the grounds that Scotland has no legally enforceable ban on fracking. July 2018: Scottish Government extends fracking licence for Ineos until July 2019. October 2018: Scottish Government publishes a “preferred policy” of not supporting fracking. March 2019: Scottish Government due to finalise its fracking policy. Photo thanks to Friends of the Earth Scotland. This story was published in tandem with the Sunday National.